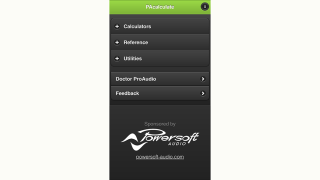 Powersoft is sponsoring the multi-platform PAcalculate app, a mobile-based tool for for PA, sound reinforcement, sound systems, electroacoustic, pro-audio, and lighting. Developed by Brusi Acoustics, a consulting firm for electroacoustic and an independent laboratory for loudspeaker directivity testing, it is marketed by Doctor Pro Audio, a leading web portal. This multi-lingual app (currently speaking Simplified Chinese, English, French, German, Italian, Portuguese, Russian and Spanish), contains many calculations, utilities and reference information. “We have decided to implement our brand on the app, by focusing on a dedicated session regarding the Powersoft limiter thresholds,” said Francesco Fanicchi, Powersoft’s brand and communications director. The tool has been developed to help users set a starting point for a limiter setup, performing real-life tests to validate and tune the results. Since these limiters follow specific Powersoft criteria, the company has added a description to emphasize that correct limiting requires at least two stages in series. The first is a slow reaction time to RMS level, designed to behave as thermal protection for the voice coil. The second, with faster time constants, is set to protect the transducer from excessive voltage peaks and therefore from mechanical damage. Finally, there is the optional Clip Limiter (Powersoft X and Ottocanali Series) with a zero-attack time and look-ahead. It is designed to set maximum voltage, which should never be crossed without adding distortion. “I hold the Powersoft brand in very high esteem for its constant innovation, both inside and outside of their comfort zone, so it’s great to see Powersoft as a sponsor of PAcalculate and join the ever growing community of users across the different platforms,” said José Brusi, the developer of the app. The PAcalculate app can be downloaded here.